The SENresearch spectroscopic ellipsometer family covers the widest spectral range from 190 nm (deep UV) to 3,500 nm (NIR) in one tool. FTIR is applied in the near infrared, allowing an extension to3,500 nm at highest spectral resolution and speed. The Step Scan Analyzer principle is a unique feature of the SENTECHspectroscopic ellipsometer family. During data acquisition, polarizer and wide band compensator are fixed to provide highest accuracy of the ellipsometric measurement. The SENresearch spectroscopic ellipsometer features FTIR ellipsometry in the near infrared. Based on the new SENTECH solution (psi, delta)- spectra are measured inless than 10 seconds thereby accumulating more than 1000 wavelengths in a spectral range between 700-2500 nm wavelength. Spectral resolution of less than 1 nm can be achieved. The spectroscopic ellipsometer SENresearch measures thin film thickness, refractive index, extinction coefficient, and related properties of bulk materials, single layers, and multi‑layer stacks. Isotropic and anisotropic materials, surface and interface roughness as well as gradients can be analyzed. Furthermore, SpectraRay/3, SENTECH proprietary ellipsometer software, treats sample effects like depolarization, non-uniformity, scattering (Mueller-matrix), and backside reflection. 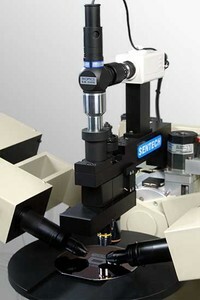 The SENresearch represents the high end of SENTECH spectroscopic ellipsometers. 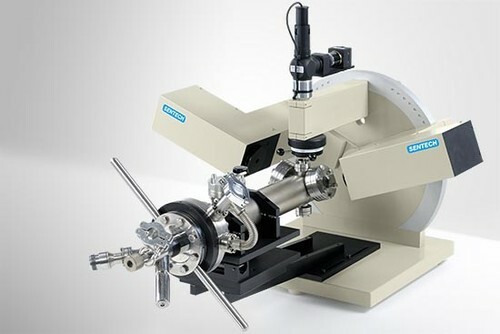 The compact table top instrument comprises the ellipsometer optics, goniometer, sample platform, auto-collimating telescope, light source, and detection unit. 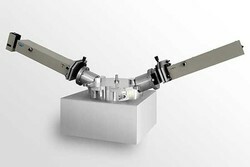 It can be extended by a variety of options for any R & D and routine application. The SENresearch is focused on speed and accuracy for insitu and exsitu measurements of thin films wherever they are applied. Applications range from measuring on textured surfaces to determining the conductivity of TCO films, from insitu monitoring of deposition processes to offline mapping on large glass panels. For a large variety ofapplications predefined recipes are offered by SpectraRay/3 for spectroscopic ellipsometers.